Bed bug are invading not only houses but also business establishments. To kill the pests and prevent their return, GreenBeanBuddy.com suggested the use of Bed Bug Bully, the non-toxic bed bug solution. ...among the many bed bug sprays available today, it recommended only the use of Bed Bug Bully. Terminix, a pest-control company, reported earlier this month that there was an increase of bed bug incidents in many US states. And as shared by MarketWatch.com, 70 percent of the complaints the company received were from businesses. Wanting to help business owners fight back the pests, Green BeanBuddy suggested the use of Bed Bug Bully's non-toxic bed bug solution. According to the marketwatch post, a number of business industries are more prone to bed bug presence. Because the pests are carried by people, the heavier the traffic is in an establishment the higher is the possibility that it will be infested, it stated. To prevent bed bug presence in businesses, the post gave managers a number of suggestions in developing a right plan of action. On the other hand, GreenBeanBuddy said that regular inspection, immediate action and the use of an effective solution can eliminate bed bugs and prevent them from causing more problems. Here's an excerpt of the post Bed Bugs Bit Businesses Bad by GreenBeanBuddy.com. 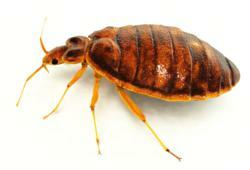 “Bed bugs are small insects. However, don’t let their size fool you. They can cause huge problems. And I meant problems not just in houses. Even in businesses, their presence can cost you big. GreenBeanBuddy, a green cleaning website, said that to prevent bed bugs from causing financial losses to businesses, an effective solution is needed. Nonetheless, among the many bed bug sprays available today, it recommended only the use of Bed Bug Bully. As the site said, because of the natural Bed Bug Bully ingredients, the product is safe. Hence, the use of it is not a risk to health and the environment, it added. Get Your Bed Bug Bully Today.